Above Photo: Brent Hueth presents on the State of the Co-op Economy at the Co-op IMPACT Conference this month. In recent years, NCBA CLUSA has estimated that there are about 40,000 cooperative businesses within the U.S. Now, new research from the University of Wisconsin–Madison’s Center for Cooperatives (UWCC) has validated that number. In a presentation at this month’s Co-op IMPACT Conference and a companion piece headlining the Fall 2017 issue of the Cooperative Business Journal, Brent Hueth unpacks the center’s foundational work to develop the data infrastructure necessary to measure the cooperative economy in a way that enables ongoing reporting and analysis. While an economist’s perspective on cooperative impact doesn’t necessarily tell the complete co-op story, a national cooperative census is integral to communicating effectively about co-ops in the public policy space, said Hueth, who directs the Center for Cooperatives and is spearheading its work to measure the cooperative economy in partnership with NCBA CLUSA and its Council of Cooperative Economists. The new report, coupled with anticipated federal data from the 2017 Economic Census, will put the U.S. at the forefront in national reporting on the cooperative sector. Culling data from all major sectoral trade associations, a 2015 InfoGroup report on U.S. business establishments and a UWCC survey of new cooperative startups, the UWCC team identified 39,594 cooperatives, excluding the housing sector. 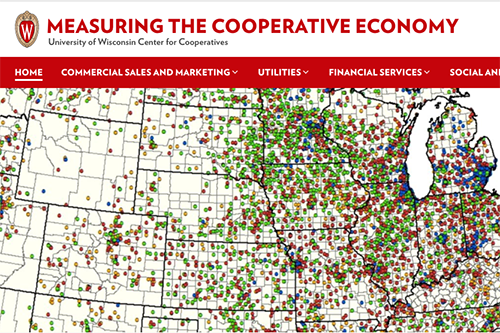 The UW Center for Cooperatives’ new website is a hub for baseline data critical to measuring the economic footprint of co-ops. While some cooperatives are easy to identify—they have “co-op,” “cooperative” or “credit union” in their name—there isn’t a systemic way of identifying cooperatives without such telltale signs. The new report represents painstaking research on thousands of individual enterprises by a team of some 40 researchers. Still, there are 7 million employer businesses out there that remain “potential co-op candidates,” Hueth said, but cannot be confirmed. That’s why working in tandem with the U.S. Census Bureau will become pivotal. Since the UW Center for Cooperatives’ first report on co-op economic impact in 2007, the center—along with the U.S. Department of Agriculture, NCBA CLUSA and other stakeholders—have worked diligently to transfer the collection and ownership of that data back to the U.S. Census Bureau. A breakthrough moment came in May, when the Office of Management and Budget approved the addition of a question identifying cooperative businesses to the 2017 Economic Census, ending a decades-long absence of federally-reported data on co-ops in the U.S.
Data collection by the U.S. Census Bureau will begin in 2018, with a “first glimpse” potentially available as early as 2019, but more realistically sometime in 2020, Hueth said, assuming funding for the Census is appropriated. In the meantime, co-op economist and advocates can begin deciding what to do with the new numbers. Hueth has identified three public policy areas where co-ops hold “significant relevance”: competition in markets, inequality and the concentration of corporate power within the political sphere. “As economists, we still want to use numbers—others might want to use stories—but we do want to go beyond just those baseline numbers of economic impact to more fully measure cooperative impact and its potential to shape public policy,” Hueth said.